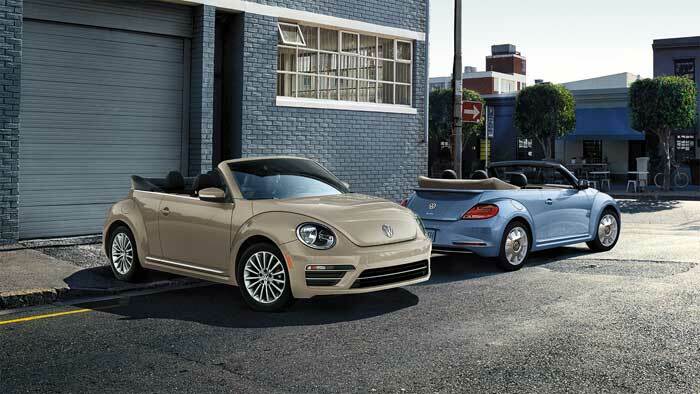 VW is killing off the Beetle in 2019 and ahead of that it has rolled out a new Final Edition of the car in coupe and convertible form. The cars will be offered in SE and SEL trims. All final Editions will get special touches like two special colors called Safari Uni and Stonewashed blue that are throwbacks to the first-gen Beetle’s end in 2003 in Mexico. Other colors include Pure White, Deep Black Pearl, and Platinum Gray. All SEL convertibles will come with brown tops except the Safari Uni shade. SE models get unique 17-inch wheels while SELs roll on 18-nch white wheels. All get keyless access, leather wrapped steering wheel, automatic climate control and more. SEs get a 6.3-inch infotainment system, voice control, and more while SELs get navigation and more. All versions use a 2.0L turbo four making 174hp and 184 lb-ft of torque. SE versions get cloth and leatherette while SELs get diamond stitched leather. SE coupe starts at $23,045 with SE convertible at $27,295. SEL coupe starts at $25,995 with the SEL drop top at $29,995. All prices are in addition to the $895 destination charge.